One of the most popular goddesses in Egypt. Isis belongs to the Ennead of Heliopolis, and according to the Heliopolitan genealogy is a daughter of Seb and Nut, sister and wife of Osiris. Possibly she was originally the personification of the throne (her name is written with the hieroglyph for throne), and as such she was an important source of the pharaoh's power. In the Hellenistic time Isis was the protrectress of sailors. In the Osiris myths she searched for her husband's body, who was killed by her brother Seth. She retrieved and reassembled the body, and in this connection she took on the role of a goddess of the dead and of the funeral rights. Isis impregnated herself from the Osiris' body and gave birth to Horus in the swamps of Khemnis in the Nile Delta. Here she raised her son in secret and kept him far away from Seth. Horus later defeated Seth and became the first ruler of a united Egypt. Isis, as mother of Horus, was by extension regarded as the mother and protectress of the pharaoh's. 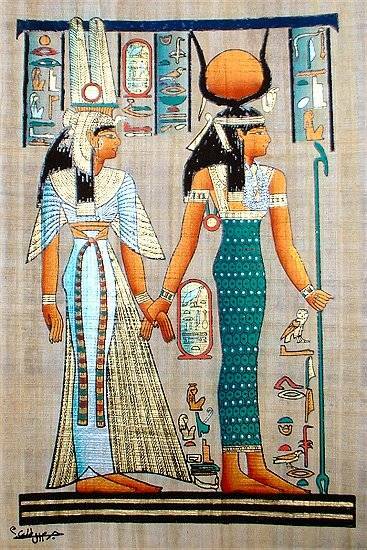 She was worshipped as the divine mother-goddess, faithful consort of Osiris, and dedicated mother of Horus. Isis was depicted as a woman with the solar disk between the cow horns on her head (an analogy with the goddess Hathor) or crowned with a thrown, but also with the child Horus sitting on her lap. A vulture was sometimes seen incorporated in her crown. Also she was sometimes depicted as a kite above the mummified body of Osiris. Isis' popularity lasted far into the Roman era. She had her own priests and many temples were erected in her honor. On the island of Philae in the Nile delta her largest temple was situated (it was transferred to the island Agilkia in 1975-1980). 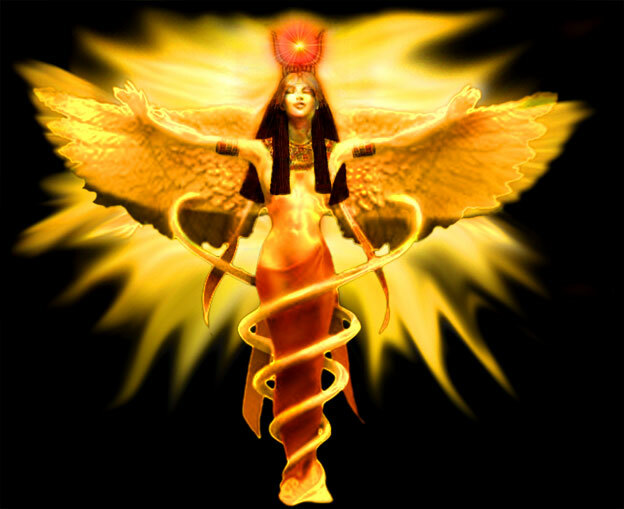 Isis (mythology), in Egyptian mythology, goddess of fertility and motherhood. According to the Egyptian belief, she was the daughter of the god Keb (Earth) and the goddess Nut (Sky), the sister-wife of Osiris, judge of the dead, and mother of Horus, god of day. After the end of the Late Period in the 4th century bcbc the center of Isis worship, which was then reaching its greatest peak, was on Philae, an island in the Nile, where a great temple was built to her during the 30th Dynasty. Ancient stories described Isis as having great magical skill, and she was represented as human in form though she was frequently described as wearing the horns of a cow. Her personality was believed to resemble that of Athor, or Hathor, the goddess of love and gaiety.